Through moving we learn about ourselves and our environment and how that supports our learning of everything we do and of what we are. In today’s global matrix where imagery to some extent shapes our reality, the economic structures that we are encouraged to live by impacts on our lives in such a way that it forces us to unknowingly define who and what we are by the values and norms that it boldly places before us. In working with our physical selves we can explicitly recognise that we are working with the essence of our being in a way that can counteract the negative impact of society’s will upon our bodies. Working with our physical bodies presents a way of tapping into the core of ones essence and thus existence through the simple action of movement. We live in an age where the ‘N’ in Need and the ‘D’ in Deadline takes priority over people's lives, and moves the focus away from our life, placing it in a somewhat alluring manner, on our lifestyle. Our bodies are formed and informed by the choices we make through our lives, and as such it is essential for man to have more than just a physical awareness of himself, but also a spiritual connection with the body. A conscious awareness of self, facilitated through a continuous physical and psychological dialogue with the body in order to negotiate and support the health and well-being of the individual within our now dense and outwardly focused existence. The modern lifestyle, a dilemma or state of mind which I refer to as attention dualism, the turmoil between body subject and body object - life or lifestyle. Our modern day lifestyle can to a certain degree, place great demands upon our bodies, gambling with the mental, physical and emotional health of the body, which can result in subjecting the body to the destructive forces of stress and tension, shifting the body’s natural state of equilibrium. The human body is a beautiful and carefully crafted phenomenon, organically formed with its own self sustaining arsenal of tools to quickly react to negative change, adjusting by counteracting the varying degrees of stress and tension it may encounter. Despite this unique bodily defence system that tries to preserve the body, one must keep in mind that a machine whether mechanical or organic uses energy to perform a function and as such needs to be fuelled to enable it effectively to perform that function. Fuel, in the form of physical activity such as dance, as part of an individual’s healthy living agenda greatly enhances the body’s ability to cope with the varying degrees of social, environmental and physical stress placed upon our bodies. Dance is one of the most natural expressions of life, one of the most basic and fundamental forms of communication known to man, the ultimate language of the body in mental, physical and spiritual motion. In order to contribute to the development of a healthier mind/body connected society, introducing dance into an individual’s life at an early age, presents an ideal chance to initiate a cultural norm of health and wellbeing through exercise. By sowing a seed that places focus on physical activity in the form of dance, as part and parcel of the present and future lifestyle of the individual, provides an opportunity to action dance as part of a cultural norm within our disembodied society. This action will in turn create a greater platform for dance to further impact society, to bring clarity and understanding about this empowering art form. An opportunity that offers wide and far reaching benefits that enables an individual throughout their life, to bring a deepened awareness and focused attention to the preservation of their health through the simple act of moving and dancing. Dance has the potential to motivate and excite people. It can provide an active and non-competitive form of exercise that has enormous physical health benefits as well as emotional and psychological relief. Further health benefits such as improved organ function and kinaesthetic benefits to improve flexibility, posture and body alignment can greatly support the future health of an individual through to old age. The aerobic nature of dance provides total body care, improving involuntary body functions such as respiratory, nervous and defence systems, helping the body to be less vulnerable to disease and other illnesses. Dance can be used as a tool to aid self development and learning through a creative process that allows an individual to physically learn through an experiential journey of exploration and discovery within a self supportive framework. Social benefits such as improved social and communication skills through the interaction and participation in group activity allows individuals to share dialogue and exchange within a developmental framework. Dance is a powerful tool to bring people of different cultures and communities together to exchange in a dialogue that helps to facilitate a more cohesive community of tolerance and understanding. Other benefits of dance are its approach to structure and discipline; attributes that can greatly support the development of young people to help them shape their present and future vision. Helping to reduce social isolation and exclusion in situations where the awareness of the word difference is misunderstood and abused. 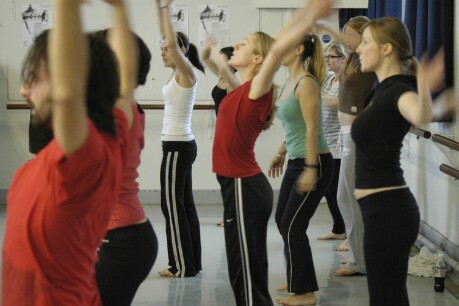 Engaging in the practice of dance as a means to support the health and wellbeing of an individual will allow participants to experience an enhanced state of physical, mental and emotional happiness; it will enable people to gain an appreciation of themselves, their environment and the people within it. You will be able to gain a more focused perspective on where and who you are in life, and how you can fulfil the potential that lies within and ahead of you. All of these benefits are possible by simply moving and dancing to the rhythm of the beat in harmony with the awareness of your own beat. © 2010 Copywright - Movement Angol, ‘Moving for Life' / All rights reserved. Any reproduction of any part of this article is not allowed without the prior written consent of Movement Angol Dance Company. Francis Angol is a choreographer, dance lecturer and performing artist who has been working in the art of physical expression for many years. Francis has now instigated a research journey into the subjective self, which focuses on the embodied nature of the African dance expression within the context of health and wellbeing. Francis combines his practice as a dance artist / Somatics Movement Educator, with his knowledge and experience of the expressive body, to offer individuals a life enhancing opportunity to bring about a more conscious awareness of the self. His work allows individuals to explore personal pathways into the body, for a life changing experience to reclaim a sense of wholeness within oneself.